If your group is interested in working with animals and is filled with people keen to spend time in the great Argentinian outdoors then this worthwhile project is ideal for you. 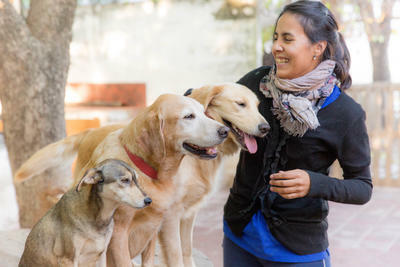 As a group volunteering in Animal Care, you can have the opportunity to work in a dog shelter, where your group will get the opportunity to care for the animals and possibly even assist the vets in treatments and operations. A volunteer pets the dogs at the dogs shelter in Cordoba, Argentina. Located in Villa Allende, 20km from Cordoba, the shelter accommodates more than 150 dogs who stay at the shelter until they can be re-homed. This shelter is run by the local town hall, however it receives little funding and the conditions are extremely basic. Groups working on this project will be based in Cordoba where you can live in a host family, hostel or hotel. Volunteers can help to feed and provide water to the dogs, as well as give them the love and attention that they need. Volunteers will also assist with vaccinations and delousing the dogs when necessary, as well as cleaning the dog cages and building new kennels. Help is also appreciated with finding new homes for the dogs and maintenance work at the shelter. Community days and weekends are often dedicated to the entire group taking puppies and finding them new homes in the town centre. There is also a vet that works at the nearby clinic that the group may be able to observe carrying out checks and procedures on domestic pets. 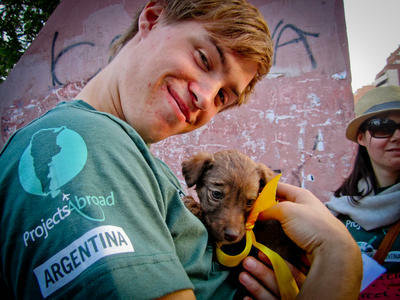 A volunteer takes care of a puppy on the Animal Care project in Cordoba, Argentina. At the dogs shelter there is likely to be plenty of hands-on work for all volunteers to get involved with throughout the week. The group are then rewarded with a variety of recreational activities at the weekend. These include activities such as trips to the surrounding hills, a bonfire or a games night. Speaking at least some basic Spanish is recommended and the more you speak, the easier you will find it find foster families for the dogs. On your first day you will be introduced to the placement supervisors and the vet you will be working with. You will typically work for about four hours a day.